Whether if you’re looking for new and delicious healthy snacks that support you fit and healthy lifestyle or if you just want to reduce all the artificial flavors and sugar from your diet, then these healthy snack monthly subscription boxes are just for you! Below, you’ll discover some of the best healthy snack boxes that will make you love staying fit and healthy more and more every month. Here are the best healthy snack subscription boxes that you can subscribe to every month. Plus, they’re even great for the office or startup! What it costs: $12.99 to $39.99 a month depending on your box size. What you get: Inside every Urthbox, you’ll discover healthy new organic, GMO-free, and, all-natural snacks, foods, and beverages that are perfect for your home, office, or startup! Plus, you even have the choice to choose between three different box types: Classic, Gluten Free, or Vegan! Coupon / Buy Now: Save $10 on your first box when you click here. What you get: With every Love with Food healthy snack box subscription, you’ll receive 16-20 new and delicious organic and all-natural snacks every month. Plus with every box purchase, Love with Food will donate 2 meals to hungry children. It’s such a great cause! Coupon / Buy Now: Get 25% off your first box when you CLICK HERE. What you get: When you join Bestowed every month, you’ll be sent an assortment of healthy snacks, foods, beverage, and personal care items straight to your home. And best of all, every product in your box has been review by Bestowed’s team of experts! Coupon / Buy Now: Use the code PROMO10 to save $10 HERE. What it costs: $11.99 a box. What you get: When you subscribe to Graze, you’ll get an assortment of tasty and delicious snacks every month. And as an added bonus, each of these healthy snacks delivered are free of any high fructose corn syrup, trans fats, artificial flavors and colors, and genetically engineered ingredients. Talk about healthy! Coupon / Buy Now: Click here to join Graze and get your first sample box for FREE. What it costs: $42.49 a month. 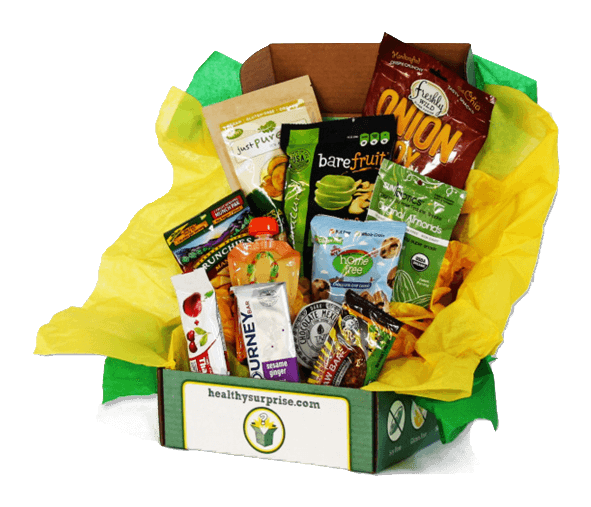 What you get: In every Healthy Surprise Classic snack box, you’ll receive high quality snacks than range from snack bars and nuts to drinks and exotic sweets, fruits, and veggies. And best of all, every month, your collection of snacks will change. Coupon / Buy Now: Click here to get your first Healthy Surprise box today. What you get: When you join Nourish Snacks, you’ll be able to sample a wide variety of healthy snacks made from simple, wholesome ingredients that you can trust. Plus there’s even a collection that specially made for offices and startups! Coupon / Buy Now: Join Nourish Snacks here. What it costs: $19.95 every month. What you get: Inside every Vegan Cuts snack box, you’ll receive 7-10 healthy vegan, gluten free, and dairy-free snacks including a bonus goodie that you’re almost guaranteed to love. Coupon / Buy Now: Join Vegan Cuts today by clicking here. What it costs: $24 a month. What you get: When you join Fit Snacks, you’ll get a monthly box filled with healthy and fit snacks that’s perfect for a healthy and active lifestyle. Plus, with each box that you boys, you’ll help fuel the Boys and Girls Club! Coupon / Buy Now: Join Fit Snacks here. What it costs: $50 annual membership fee. But the $50 goes towards your purchases as an account credit. What you get: One of the best things about a Nature Box subscription is the fact that you are able to pick the snacks that goes in your box. Plus there are over 100 unique healthy snacks to choose from, each of which are made from high-quality ingredients with zero artificial flavors. By far one of the cheapest monthly boxes around or what you get. Coupon / Buy Now: Get 50% off your first monthly box when you CLICK HERE. What you get: Snack Nation is by far one of the best office subscription box services to get delicious healthy snacks delivered to your office. All you need to do is choose the best plan for your office and budget and voila, you’ll get a variety of expert curated snacks shipped for free every month. It’s a great way to delight your employees while also promoting healthier snacking options for the office. Coupon / Buy Now: Click here to get Snack Nation for your office. What you get: When you join Suja Juice, you’ll get 6, 18, or 48 bottles of incredibly healthy and delicious juices that are perfect for anyone who is looking to limit their calorie and sugar intake. It’s the perfect alternative to munching on snacks! Coupon / Buy Now: Click here to try Suja Juice today! Thanks for reading and hopefully you find the best service that’ll send you the best most tasty healthy snacks delivered straight to your door. And if you’re looking for more weight loss oriented boxes, be sure to check out our awesome guide here. Share This Post on Pinterest and Facebook!